If there's one occasion on the Brisbane shopping calendar that we get really excited about, it's James Street Up Late. It might be the heavily discounted goods from some of our favourite designers. It might be that we get to actually meet a lot of those designers in store. It might be the complimentary Champagnes you're likely to be faced with throughout the night. Or it might just be the totally sick goodie bags they give away in droves. But, whatever the reason, James Street's marie claire Up Late is our favourite Thursday night, and this week it's on again! Hurrah. So get your shopping shoes on, because we've put together your essential itinerary to this night-of-nights, including the best spots to grab a bargain, where the big names will be waiting to greet you, and where to stop for that much needed bite to eat. 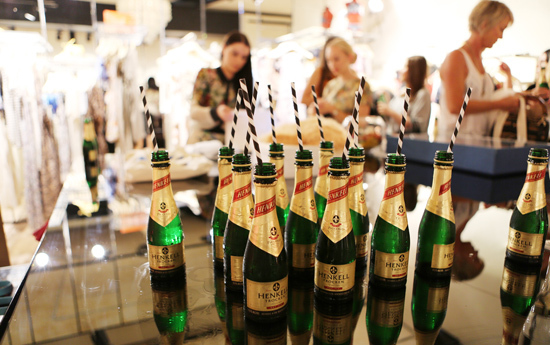 Head to Sixes and Sevens at 6pm to catch marie claire editor Jackie Frank and her team of experts as they welcome guests and kick-start the evening in style. Ok, so we all like to pretend we're not swayed by the lure of freebies. But who the heck are we kidding? The marie claire lounge (next door to Beau In The Woods) will be giving out the coveted James Street Up Late goodie bags to the first 1000 guests. Get there quick, kids, these little babies will be going fast. Once you have your goodie bag in hand, we recommend you pop in at Lee Mathews, where every shopper on the night will receive a free gift with purchase, or Jules and Roc next door for 20% off your fave Australia's labels like Ellery and Manning Cartel. The ladies at camargue — one store that's known for its Up Late revelry — are celebrating because they've had a their much anticipated new Être Cécile collection arrive in time for Thursday's party! This European label are known for their unique and highly collectable t-shirts and sweaters, and they are going to run out the door, so be sure to get there early. Camargue also has new Tom Binns, Lutz, and Current Elliot in stock, which equals fun times for fashion fans. Who says Up Late is just good for the girls? The sartorial menswear specialists at Pistols At Dawn are giving a free shirt for every jeans purchase, so grab your man and send him in for a wardrobe spruce up! The cool cats at Calexico are celebrating the launch of their online store with a frat party, where there'll be ping pong and tunes to keep you busy while you puruse their new season styles. Even better, if you Instagram a snap of yourself instore you can go in the running to win a Sophie Hulme bag. With all the strolling (and shoe shopping— Nat-Sui, Maryon's or Tom Gunn are all waiting for you on the James Street strip) you're going to be getting up to tonight, it's a great opportunity to spare a thought for your feet. Visit the Health Place to make sure your new shoes are perfect for your feet. Get podiatry tips, cosmetic acupuncture, healthy goodie bags and more at this haven of wellbeing! Cult label Aje will be opening their brand spankin' new boutique just in time for the Up Late celebrations, bringing their unique brand of disheveled, embellished glamour to the crowds. Come in store from 6pm (Shop 10A Centro on James) for a chance to meet the designers, and exclusive offers. Transport yourself to Paris at French Rendez-Vous, where you can shop the latest collection at 15% off, with a glass of bubbles in hand no less. Ooh la la! If you've ever walked past the Thai Foot Spa before and wondered what goes on inside, take a sneak peek of the tranquil space and enjoy an express massage treatment. Whether it's a Campari spritz over deliciously cheesy arancini or something more substantial, head to Bucci and help them celebrate their second birthday. Buon Compleanno! Harveys Bar + Bistro has a one-off lunch and dinner menu on offer just for Up Late. They've teamed up with the wine master at Craggy Range to bring you a decadent menu special, featuring quail with beetroot, hazlenuts and labna, and lamb rump with tahini yoghurt, all accompanied by Craggy Range wines. If you are yet to experience the gastronmical delights of Gerard's Bistro, Up Late is the perfect excuse to lose your GB virginity. Having just launched a new menu, we'll definitely be stopping in at Gerard's for a drink or two and some menu sampling. There's also rumoured to be a bangin' pop-up bar happening in the car park behind the Bistro, with a DJ, cocktails and canapes. Aje will be opening up their brand spankin' new Brisbane store for the Up Late, and designer duo Adrian and Edwina are on hand to be your personal shoppers for the night! Pam Easton and Lydia Pearson will be in-store at Easton Pearson taking you on a journey to the Pleasure Garden, the latest collection that will have you swooning over their signature patterns and embellishments. 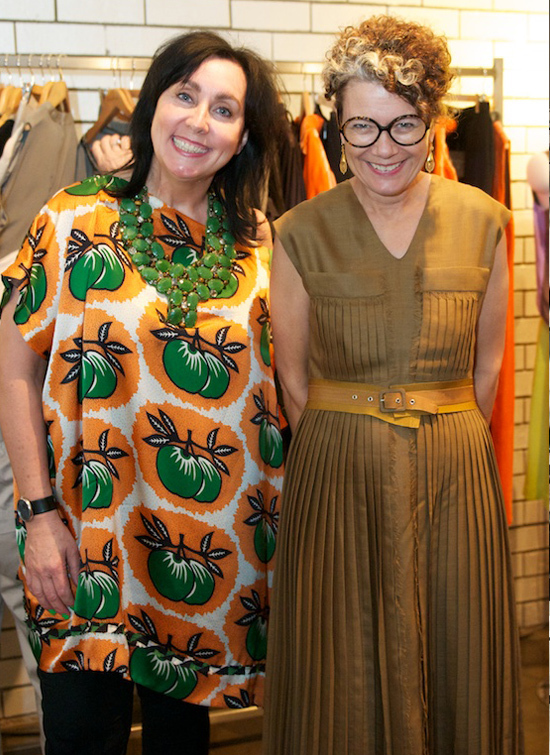 Samantha Ogilvie Boutique has designers Megan Park and Belynda McPherson in-store for one night only, so you can get first hand advice from these style mavens. After being nominated as one of the best retailers in the Australian Jewellery Awards (fingers crossed for the ceremony later this year), meet the local jewellery designers who are shining at Stone + Metal. Editor's Tip: As your stroll the James Street strip, don't forget to share your experience using the #JamesStUpLate hashtag. The best photos from the night will go in the running to win a $500 shopping spree thanks to our generous friends at James Street!